An audio version of this interview originally appeared on Bullseye, a weekly radio show and podcast hosted by Jesse Thorn. You can listen to it on select public radio stations, at the Maximum Fun website, and via iTunes. 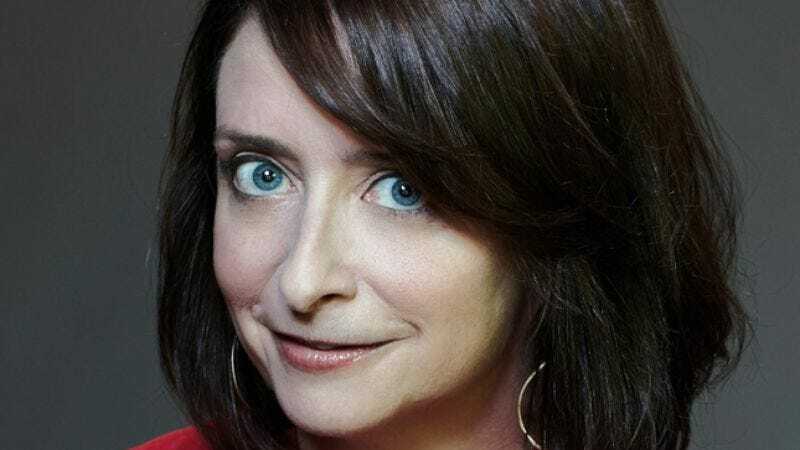 Rachel Dratch was a Saturday Night Live cast member from 1999 until 2006, introducing characters such as Hollywood producer Abe Scheinwald, the moment-ruining, sad-trombone-inducing Debbie Downer, and Denise “Zazu” McDonough, the absurdly thick-accented Southie teen. After her run on SNL ended, Dratch had to adjust to the life of a regular working actress, without a steady job for the first time in more than 10 years. She’s worked in TV, film, and theater since, with recurring roles on 30 Rock, among others. But the biggest change in her life is a baby. In her early 40s, she’d been long-distance-dating a boyfriend for a few months when she discovered, to her shock, that she was pregnant. Her new book Girl Walks Into A Bar is about her career, her dating misadventures, and her life as a fortysomething new mom. RD: Well, they’re all very tall, and most of them have imposing figures. But I actually think that was good training, because I was the only woman on the team, so if I wanted to get out and say something, I would really have to get out there and say something. So it was a good group to be in. AVC: Often on a five-person improv team, there’s one woman, or on a six-person team, there’s two. It can be easy to just be the person who comes in when a woman is needed, unless you have the guts to push yourself forward. RD: Yeah, in the book I talked about the “Honey” roles. It’s like, “Honey, your coffee’s ready!” or “Honey, are you gonna pay this bill?” That kind of thing. For women in improv, the earliest lesson is, “Don’t just play the side lady who comes in to serve imaginary coffee.” I thought of myself as gender-neutral, so I could play a dude or Santa Claus or the president or whatever. So just don’t limit yourself that you’re the woman, and then you have much bigger range. AVC: Was it difficult to learn to push yourself forward? RD: I think for anyone—male or female—in improv, the biggest thing to get over is the fear. I think every improviser has that. You don’t want to get too in your head and be like “This has to be really funny!” So it’s just sort of experience, over and over again, getting out there naturally and having a flow. I don’t know how gender-specific that is. AVC: I don’t mean to revel in your misfortune, but I enjoyed reading how little you liked attending Dartmouth. RD: Well, that’s where the comedy lies, I guess. RD: As I said in the book, when you’re 18 and you’re looking at college campuses, you’re like, “Oh, this is such a pretty campus!” and that’s all. Also, it was probably one of the best schools I got into, so I wanted to go to my best choice, I guess. This is also back in the ’80s, so I don’t want to slam Dartmouth too hard. When I’ve been back to campus, I’ve seen a lot more nerds walking around, so I think it’s gotten better. When I was there, it was super-conservative, and I just didn’t really know what kind of right-wing area I was jumping into when I went. AVC: From your description, it sounds like you were going to college in a snobs-vs.-slobs college movie with no slobs. AVC: How did you figure out that comedy was not just the path for you, but was even a possible path? RD: I was sort of the class-clown type, and I was also in school plays, and I always liked comedy. I was attracted to comic roles. So I was already into it as a hobby. I wasn’t one of these people that’s like, “I wanna be an actress, I’m gonna go out and be a big star,” I was more like, “Well, I have fun doing this as a pastime,” and then I thought, “Well, I’ll just give it a shot, because I don’t want to go through life thinking, ‘Oh, what if I’d given that a shot?’” So that’s how I gradually got into the whole career of it. AVC: There has to be something that gets you to put everything you own in a car and drive to Chicago. RD: What was that? [Laughs.] I don’t know! I started doing improv in college, and I really liked it. God, I don’t even know what propelled me to Chicago. In my improv group, we had gone to check out Chicago, so I thought, “I’ll just try it and see what Chicago’s like.” I didn’t have any instant success; each year, I would make a little more progress, so that kind of kept me in it. AVC: Did you ever develop a scheme for success? Was the goal “I’ll get to the Second City main stage,” or “I’ll get into the touring company of Second City,” or “I’ll become a professional actress,” or what? RD: It was definitely Second City. That’s why I moved out there. I ended up doing ImprovOlympic as well. The first thing was, “Oh, I got on the house team of ImprovOlympic,” and then you’re in it for another year, and then I got in the touring company of Second City, and then that’s your path to getting on the main stage at Second City. So I was in Chicago for nine years, and I did the main stage for four years. RD: No, no, what happened was that they came to scout when I first got on the main stage, and that’s when I didn’t get asked to audition. I had just started on the main stage, and I didn’t really have any characters yet. Then they came back three years later, and I got to audition, but I didn’t get it that year. Then I got to audition a second time, and that’s when I got it. RD: Well, when I didn’t get SNL, I moved out to L.A. and nothing really happened. Then I did Dratch And Fey with Tina [Fey] after being in L.A. for eight months, and then I got SNL. AVC: The Saturday Night Live audition has a very specific format: You do a certain number of original characters and a certain number of celebrity impressions. You’re not an impressionist, particularly, so what was it like for you when you had done one round of auditions, to come back a year later with a whole new set of stuff? RD: I felt like I’d used the really good stuff the first audition, so then I had sort of my second-string characters. I didn’t feel quite as good about the characters I’d brought, but I came back with a lot more impressions than I had the first year, so maybe it all balanced out. AVC: What impressions did you do? RD: I think I did Drew Barrymore, Sarah Jessica Parker… Oh jeez, I don’t remember. The first time, I did Calista Flockhart. That was my one good impression. I did Paula Poundstone, if anyone even knows who she is, the stand-up comic. I don’t remember the other ones, it was like 80 years ago. AVC: I like the idea of Saturday Night Live running a whole string of Paula Poundstone-based sketches. RD: I actually did end up doing her on the show once, in one of those scenes where they have a string of people come through the door. AVC: Did you already have friends working on Saturday Night Live when you went to work there? RD: Tina was there writing, and Adam [McKay] was there writing, and Horatio [Sanz] was a cast member. That’s pretty much who I knew. AVC: How did that affect your entrance into that world? It seems like some people kind of drop into it and are overwhelmed. RD: It can be really overwhelming. I’m sure it helped me that Adam and Tina were there. I ended up writing a lot with Tina, and she already knew the ropes. The way a scene works on SNL is very different from Second City, because at Second City, you can take your time and develop a character more; it’s more of a theatrical experience. But at SNL, someone’s gonna change the channel—you have to have the jokes out there right away. Tina knew that in a way that I didn’t, so she helped me when I first got there. If I had a character idea, it could be a great character, but I didn’t know how to get it into an SNL format, so I wrote a lot with her, and I’m sure that helped me greatly. On the flip side, though, when you get there, it is just sink or swim. No matter who you know, at the end of the day, you’re kind of on your own. You just have to figure out the system. AVC: Do you remember the first thing you got on the air that really worked? RD: The first thing I had a part in writing was Sully and Denise, which I wrote with Tina. Tina and I used to do these Boston characters at Second City, so we brought them to SNL. That was the first thing I had a part in writing that really worked. AVC: The schedule of Saturday Night Live is crazy. One of the things that’s lost because the production is so slick, is that it’s genuinely a live show that is almost completely written, rehearsed, and performed within the space of a week. Sometimes it’ll be a couple of weeks in a row of working continuously insane hours. What was it like to have, for that long, a job that so dominated your life? RD: You kind of get used to it. It’s what you’ve wanted for your whole comedy life, so you’re psyched to be there when it’s like 3 in the morning, because it’s like, “Oh my God, I’m on Saturday Night Live.” The thing about the schedule was that it was so intense when you’re on, but then you also had all these weeks off in between, so it was actually a lot easier than the Conan schedule or something like that, where they’re there weeks and weeks in a row. As for each individual week, Monday and Tuesday night are the writing nights, so Tuesday night, you’re there all night until the sun comes up. Then Wednesday when you stumble in at 2 p.m. is the read-through of all the scenes that have been written, then you wait and see if your scene gets picked. Then Thursday and Friday are rewrites and rehearsal… You soon learn to not make any plans with outside friends, because you’ll probably have to break them. It’s a very nocturnal, intense schedule, but I think that goes along with comedy. AVC: Even outside the issue of having a kid, having just a romantic relationship is very different when you’re a person of leisure, rather than the mentality of working on Saturday Night Live, where your social life was defined by your work. RD: Right. Well, in theory, when I was on SNL, I should’ve had a lot more time to date. I really had time to date at SNL, I just used SNL as my excuse of why I wasn’t really actively pursuing the whole dating scene. It was my comfort zone, so I didn’t have to put myself out there. I could just hang with these really funny dudes and my friends from outside, and I had my whole little comfortable situation. So why go out with a total stranger, you know? RD: I think that would’ve just been a little weird. It was sort of a brotherly situation going on there. Everyone’s sort of like a big happy family. AVC: Was it scary and hard? RD: I don’t really like going on dates, so that part of it was scary, using the word very mildly. No more than it is for anyone else, I guess. I’m kind of shy. I don’t know, let’s stop talking about me. [Laughs.] Who cares about my dating psychology? It’s probably the same as every other lady in New York. Maybe not, I don’t know. I couldn’t really go online, I felt… Or I was using that as an excuse, because I didn’t want it to be, “That’s the girl from SNL!” and have it all over every website. So I didn’t really want to go online, which I guess is an option for ladies who aren’t on TV. [Laughs.] Other than that, I don’t know. Does anyone like dating? AVC: Honestly, I haven’t dated since high school, so I couldn’t tell you. But I don’t think people do. RD: I don’t know what conclusion to draw from this. [Laughs.] I have no wisdom to share on dating. AVC: It seems like a lot of the dating you did was really a matter of putting your head and shoulders down and plowing your way through what was left of the dating pool. RD: I went on some normal dates, too, but normal dates don’t make for a funny story. So you write about the ones that something was a little off about. That’s where the laughs lie, am I right, ladies? AVC: The title of your book, Girl Walks Into A Bar, comes from the fact that you actually ended up meeting the father of your child at a bar. He was just a good-looking guy you ended up chatting with while you were waiting for a drink order. RD: I was with my friend sitting outside, and service was kind of slow, so I went in to get our drinks, and he was just standing next to where I went up to the bar. He was with his niece and her boyfriend, he was visiting from California, and they were about to drink absinthe. He was like, “We’re about to get absinthe, have you ever tried it?” and I said, “Ugh, that stuff is disgusting, don’t do it.” And then we just started talking, but it wasn’t pickup-y at all. We just started chatting. I had to go back out to my friend, and I was like, “Oh, you guys should come join us.” So they came and sat outside with us, and that’s how it all started. RD: Oh yeah, that definitely happens. What strikes me is that you say “dating” as if I went on more than five dates, as like a super-active term, and that’s not really true. It didn’t really factor in, as far as I knew, that I was on TV. Maybe one of them, but I’ll let you read the book for that one. AVC: You started dating this guy, and as you mentioned, he was in town from California, from Mill Valley if I remember correctly. He must be Mill Valley’s only Republican. RD: First of all, I’m not sure he’s a Republican, even though I put that in the book. [Laughs.] He’s like, “Everybody’s coming after me saying I’m a Republican!” He’s of questionable political affiliation, possibly leaning toward the right. [Laughs.] I think he’s pissed at me for that. AVC: Even at that, he’s Mill Valley’s only one of those. RD: That’s true. And he moved here… Well, am I ruining the suspense of the book? Maybe. Well, he came from Mill Valley and now he lives in loud New York, so he made the ultimate sacrifice. AVC: When you found out you were pregnant, the two of you had been dating for a matter of months, long-distance. RD: We weren’t like, “Oh my God, I’ve found my soulmate, la la la.” We had fun, we would visit each other, we would talk on the phone a lot. I don’t want to make it seem like I barely knew the guy, but we’d been dating long-distance for only six months, so we’d probably spent a month total in each other’s actual presence, with all the little weekends. So that’s what made for the crazy part of the story, suddenly having a baby with someone I’ve been casually dating for six months. Sounds like a screenplay to me. AVC: One of the moments that’s really intense in the book is you telling your folks that you’re pregnant. Just like anybody’s parents, I’m sure they’d been bothering you to bring them grandchildren for 20 years. RD: Actually, I knew that they would probably want grandkids, but they’d never really bugged me about it, because I think they knew it was a little spot of anxiety for me. So they weren’t hassling me, but I do think that because I was older, they’d kind of given up on the grandkids thing, and there weren’t any grandkids in the family. So I thought I was gonna come in with this great news, and they were gonna be all excited, but actually, they were kind of more stunned. They just kind of looked at me like, “Huh?” So as I said in the book, I left feeling like Juno. I felt a little like I was 16 and telling my parents I was pregnant or something. AVC: They came around pretty shortly thereafter. RD: Oh yeah. They’re, like, in love. They were very supportive, but in that moment, it wasn’t the reaction I was expecting. AVC: What happened to you, especially at the beginning, that you least expected, that you were least able to plan for? RD: I was most surprised by how well everything went, in terms of John and me dealing with a newborn. It was just kind of a strange, positive experience. You get no sleep, but I was kind of used to no sleep from SNL, and I was always a night person. So that didn’t throw me at all. We were both just together in this really cool way, when you think of our circumstances, so that was probably the most pleasantly surprising part of it. Although I do talk in the book about trying to be in any sort of seductive or flirtatious mode when you’re hooked up to a breast pump. All the mystique is gone. There’s a lot of that in the book, of looking your worst, stripped down to your inner animal core and being with the person who, six months ago, was just like, “Hey, can I get you a drink?” That was the funniest yet most surreal part of the whole story, I guess. Again with the reversed expectations, I had this idea that babies were 24/7 crying and making your life a living hell, but they really only cry when they’re tired. It’s actually been much more fun than I anticipated. AVC: What’s the most fun part? RD: I think maybe just because of my circumstances, thinking I wasn’t going to have kids, and then… I feel like I won the lottery. I don’t know if we mentioned this, but I got pregnant when I was like two months shy of 44, so I had written it off in my head. I was so extra-appreciative, because even a year later, walking him in a stroller, I’ll just be like, “I can’t believe I have a baby!” It just wasn’t the prediction I had for myself. I didn’t have many jobs going on, so I had a lot of time to throw myself into the whole mom thing, so that turned out to be a fun thing instead of a bad thing.